Both Jasmine and Emma have attended the young carers program with The Carers Foundation Australia, as they had been caring for their beautiful mum for 10 years. 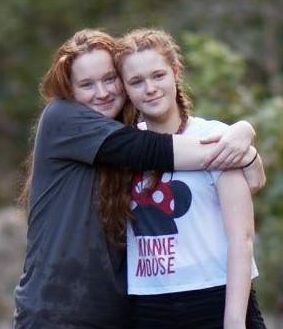 Sadly, their Mum has recently passed away, and now both girls are passionate about helping other young carers, since the program made a significant difference to their lives. Both girls have overcome hardship since they were born, being three and a half months early resulting in Emma having multiple medical conditions and Jasmine caring for her sister since day one. EMMA is living with chronic pain and spends some of her time attending multiple specialist appointments. Having lived with medical conditions all her life, she can empathise with both the carer and the loved one being cared for. The Carers Foundation offers a unique opportunity to work with people passionate about raising awareness for young people who are caring for a loved one within the community. Some advice she would give anyone who is or just became a carer would be to seek out help within the community and to seek out mental health services, as you shouldn’t feel alone. JASMINE is about to finish her Bachelor’s Degree in Entertainment Business Management at JMC Academy and spends her spare time volunteering within the community. Having interned with the Inala Community House and CF Foundation, she is looking forward to bringing her Social Media and Event experience to the team. Being a full-time care while studying full time can difficulty but manageable with the right resources and help.